Maruti Suzuki is gearing up to launch the second generation Ertiga in India on November 21, 2018. The MPV will be available in four trim levels. According to a media report, the new Ertiga will offered with dual airbags, ABS with EBD and ISOFIX child safety seat anchors as standard. Features like rear parking sensors, speed sensitive door locks, central locking, projector headlamps, LED tail lamps and tilt adjustable steering wheel are likely to be offered on all variants. The MPV also gets 60:40 split folding second row of seats and 50:50 split folding third row. The base LXi and LDi variants get manual air-conditioning and 15-inch steel wheels. The VXi and VDi variants are expected to get a factory-fitted audio system with 4 speakers and Bluetooth connectivity. These variants get steering-mounted audio and phone controls, electric folding ORVMs with turns signals, second row centre arm rest, rear AC vents and remote keyless entry among other features. Features like fog lamps, 15-inch alloy wheels, height adjustable front seat belts and driver's seat, front centre arm rest with storage, automatic climate control, engine start/stop button, rear wiper, washer and defogger are expected to be offered on the ZXi and ZDi variants. These variants also get 12 V charging points in all three rows and two tweeters. ESP and hill hold function is only available on the VXi AT and ZXi AT variants. The top-spec ZXi+ and ZDi+ variants are likely to get Maruti's SmartPlay touchscreen infotainment system with navigation, Apple CarPlay and Android Auto connectivity. These variants get leather wrapped steering wheel and rear parking camera as standard. LED headlamps with LED DRLs and diamond-cut alloy wheels are not expected to be offered on the Ertiga. 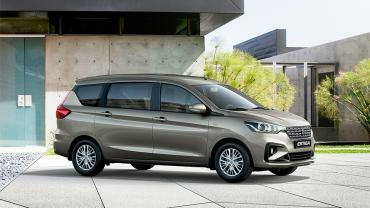 Powering the Ertiga will be a 1.5-litre, 4-cylinder petrol and a 1.3-litre, 4-cylinder diesel engine. Both come with mild hybrid technology.